The following is a paragraph on food adulteration for SSC and HSC level students. 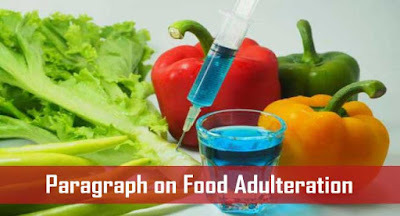 Students also find the article or essay on food adulteration and its effects. This lesson will help you learn basic idea about of food adulteration. You may read the food adulteration paragraph with Bangla meaning. You know the problem of food adulteration in Bangladesh and India. In these countries, this problem is very acute. Very soon we are going to publish this paragraph for class 5, class 6 and JSC level. Keep visiting to get the latest post as soon as published. Food adulteration means mixing unhygienic and inferior materials with food. That is a heinous deed. It is considered to be one of the major problems in our country. There are many reasons for this problem. Mainly, greed for more profit and dishonest businessmen are responsible for food adulteration. There is hardly any food that is not adulterated in one way or another. There are many bad impacts of adulterated food. They are generally harmful to health and cause serious health problems like digest problem, diarrhea, dysentery, and cancer. It reduces the quality of the food and this weakens our health. Various hotels and restaurants are also serving poisonous and unhealthy menus. Now the problem is going out of control. The situation cannot go on. The government should come forward to solve the problem. An effective law should be enforced against the culprits. They must be punished. We should try to avoid adulterated foods. We should realize the bad consequence of food adulteration. Mass media can play an important role in creating public awareness. We can surely remove this problem through our sincere and united steps. You have 5 steps to write the paragraph yourself. Now, follow this. 1. What does food adulteration mean? Food Adulteration means mixing low-quality materials with food. This is mainly done for more profit by the dishonest businessmen. It has become one of the major problems in Bangladesh. Food Adulteration means lowering the food quality by mixing inferior ingredients and substances with food. 2. What are the causes of food adulteration? 3. What are the effects of food adulteration? They are generally harmful to health and cause serious health problems like digest problem, diarrhea, dysentery, and cancer. It reduces the quality of the food and this weakens our health. It also reduces our longevity. 4. How can we solve food adulteration? An effective law should be enforced against the culprits. They must be punished. We should try to avoid adulterated foods. 5. Write a concluding sentence at the end.